Bring the vibrant, expressive sounds of nylon stringed guitar to your music with Fingerpicking Nylon A-List Acoustic Guitarist. With 60 unique styles and over 670 phrases to choose from, Fingerpicking Nylon makes it easy to produce professional-sounding performances that suit any project. Add unique textures to your EDM tracks. And explore entirely new songwriting possibilities. To get started, simply select a musical style and play notes on your MIDI keyboard. 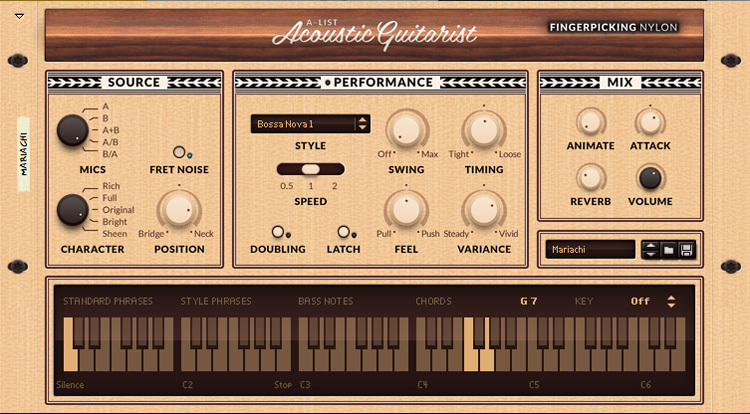 Fingerpicking Nylon will automatically play professional sounding chords, arpeggios and figures that only the most skilled session guitarists can produce. Looking for a different vibe? Quickly adjust style, tempo, rhythm patterns, and more while you’re recording. You can even double-track and adjust the mix right in the Rack Extension so you never break your creative flow. Select the tonal character of the instrument. Toggle through mic placement options to change the tone of the instrument. Makes navigating the Fingerpicking Nylon sounds a breeze. You can set the key of your song, and Fingerpicking Nylon will pick the right chords for you as you play one finger chord progressions. Or leave it off and have all chords and voicings available to you. Fingerpicking Nylon makes chord progressions easier than ever. Select any of the 60 styles to find a musical feel that matches your song. Give your guitar enriched and vivid overtones and an airy, spherical sound. Choose whether the acoustic passages should stick tightly to the time of your music, or play around it loosely. Increase or decrease the amount of reverb on your instrument. Select specific musical phrases in real-time from the MIDI keyboard. Adjust the timing to be slightly ahead or behind the beat. This sets the attack of the sound. From a softer, fingered sound to a more aggressive plucked sound.